LENR is a new science that is still as yet not understood. It will only be fully understood once commercialization has occurred and all secrets of it’s modus operandi are revealed, paving the way for computer simulations of what actually happens in the reactions. When Fleischman & Pons came out in 1989 and said they had discovered a new energy source, they made the mistake of calling it Cold Fusion, which is really inaccurate as no fusion is taking place. Fusion is what happens in the Sun and requires humongous temperatures which no known earthly material can contain, whereas LENR can take place on a table top in your kitchen. The Science of LENR was then rejected because nobody understood what was taking place in the reaction and nobody could replicate it. 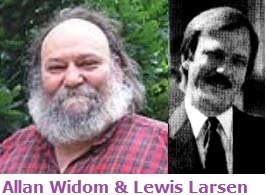 Various theories have thus been put forward to explain LENR and one of them, probably the most accurate & likely theory so far, is the Widom-Larsen, dealing with many-body collective effects first understood by Einstein. This theory is currently being used by NASA in their LENR research. It rejects the idea of fusion because fusion requires the release of gamma rays as one of its by products, yet no LENR experiment has found such deadly emissions thus far. Other theories that were put forward to explain LENR are Yeong E. Kim’s Bose-Einstein condensate and Randell Mills’ Hydrino theory. 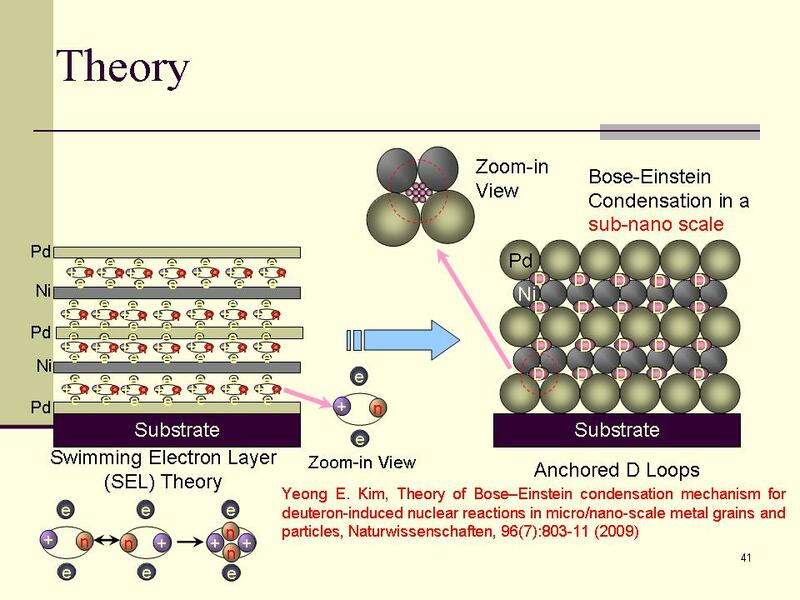 The Bose-Einstein condensate was a material developed by Einstein and Bose that exists at a temperature of absolute zero. Yeong E Kim proposes that this kind of material is formed in an LENR reaction chamber, enabling the creation of excess heat. The Hydrino theory is an entirely new form of Physics that has been largely rejected because it proposes the lowering of Hydrogen into Quantum states, called Hydrinos, that, according to known science, cannot possibly exist. This entry was posted in Uncategorized and tagged Cold Fusion, Einstein, LENR, NASA. Bookmark the permalink. I am very skeptical about the theories, and it is sad that most people have huge problem to admit facts without a theory. some deny the facts. some invent unverified theories. both to solve that inconvenient anomaly. WL theory is not the best, even if they raise good point. Kim-zubarev, takahashi are maybe more interesting. in facts as Charles beaudette says in Excess Heat book, there is only 4 articles which address the experimental results of cold fusion calorimetry (others focus on theory, radiations…). all 4 articles could not sustain serious rebuttal. with all the mass of replication don today, doubt on excess heat is not rational. Thank you for your comment. What, if I may ask, are these four articles? 1994 (D. R. O. Morrison) which was itself unsatisfactory. It was rebutted strongly to the point of dismissal and correctly in my view. No defense was offered against the rebuttal. During those first six years, the community of orthodox scientists produced no report of a flaw in the heat measurements that was subsequently sustained by other reports. better than average armchair critic. Josuah is controlling Wikipedia article as ScienceApologist and others pseudonyms… Abd Ul Rahman Lomax have well identified him. he was banned, yet he is a very strong skeptic on anything, but a little too much on Josuah beliefs. Interesting. Thanks for the input. Hopefully things have progressed well enough for calorimetry to not be an issue anymore.